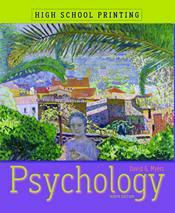 Still the best selling AP* and College textbook, Psychology by David Myers continues to reach millions of students each year. In every edition Myers combines true passion for the field with his acclaimed empathetic voice. The result is a text that students actually read and teachers adore. Bedford, Freeman & Worth (BFW) Publishers continues to collect letters of support and recognition for the author's work daily, from both teachers and students alike. Even by Myers' standards, Psychology, Ninth Edition, is truly exceptional. This exhaustive update incorporates the largest number of new research citations of any revision to date, as well as new inquiry-based pedagogy, a new art program, and the next generation of media and supplements. What remains the same is Myers' uncanny ability to communicate the science of psychology in a uniquely engaging, accessible way.